You’ve heard the saying, “Everyone and his brother”? Well, when it comes to social media, it’s all but true. Virtually everyone and his brother (and uncle and best friend and third cousin twice removed) has an account. Social media has changed how we connect, communicate, shop, buy -- and book hotel rooms. Consider this: travelers who use social media along their buyer’s journey convert at 129% higher rate. They’re also four times as likely to spend significantly more than those who don’t use social media. 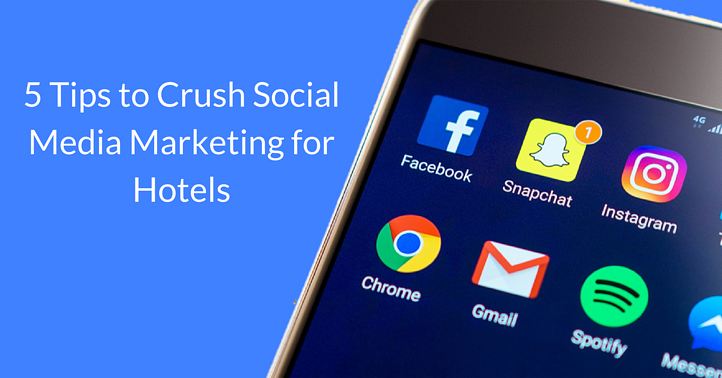 There’s no question: social media marketing is a must for hoteliers. Want to nail it? Master hotel social media marketing with these 5 tips. Travelers flock to Facebook, Twitter, Instagram, and other networks to research, find recommendations, and read reviews. Your website’s blog is an invaluable resource for them; leverage it by posting links on your social profiles to entice prospective guests to engage with you. You’ll have a stream of great content to post, and you can guide people to your website to find out more -- and, ideally, book accommodations. Social media can become a tool for massive growth in your content marketing strategy. The first stage in the travel buyer’s journey is dreaming. Visual content enables travelers to not only imagine themselves in a destination, but to actually experience similar sensations. For example, after watching a video of gorgeous tropical fish and snorkelers exploring a reef in crystalline water, we get the same jolt of exhilaration and awe. This is thanks to mirror neurons in the brain. Take advantage of this phenomenon by offering your social media fans and followers plenty of inspiration for their dreams. Amp it up: Encourage your guests to post pictures of your hotel and/or great attractions they visited during their stay. This is terrific user-generated content. You can increase engagement by incentivizing this: offer, for example, a free night, a spa visit, a restaurant voucher, etc., to the guest with the best picture of the week/month. 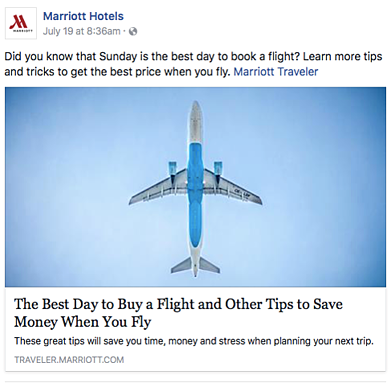 Use social media to inform travelers of promotions. This is an ideal way to let people know about your specials and offers, engage them, and entice them to come and enjoy your hospitality. Amp it up: Hotels regularly post their specials and deals; you can also supercharge your engagement and results by holding a contest. 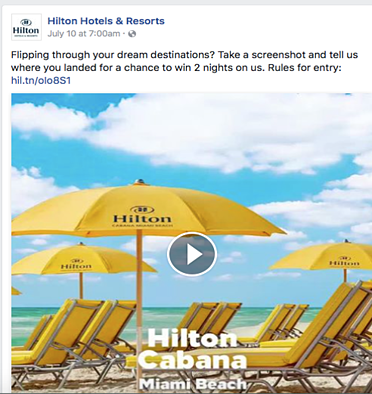 Hilton, for example, scores four points with this post: they’re offering a great prize, interacting with people, soliciting user generated content, and utilizing compelling video content. Help travelers decide where to spend their vacations; show them all of the great features and amenities of your location. Highlight must-do activities, must-see attractions, your best restaurants and retail shops, and more. Give local businesses some love. This provides travelers with essential information while promoting your city/region. Sheraton nails it in a creative way. 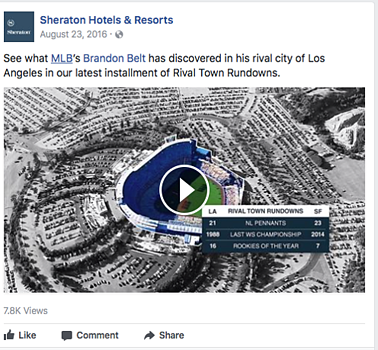 Their “Rival Town Rundown” series focuses on baseball; videos show rival fans what to do when visiting the home team’s turf. It’s a fun angle, and, of course, useful even if you don’t love baseball! Consumers, especially travelers, look to reviews for key information when making their decisions. They trust peers more than branded materials, so this is a tremendously powerful tool for hotels. Encourage guests to post reviews and ratings on sites like TripAdvisor in addition to your social media pages. Be sure to respond to messages, particularly negative comments, as quickly as possible. This gives you the chance to turn an unhappy customer into a satisfied guest with some finesse. The firm delivering your hotel marketing services can help you develop a viable strategy for navigating social reviews. Stay up to date on hotel marketing trends and get social! You can realize enhanced results by putting these tips into action. For help, talk to an agency and ask them about their social media marketing services so you can put together a killer strategy to engage your guests! You can also check out our comprehensive hotal marketing guide here or download it by clicking the banner below.